For his part, Zahi Hawass, secretary-general of the Supreme Council of Antiquities, reacted with characteristic histrionics, which for once might have been justified: "Of course, I was so worried. I have been protecting antiquities all my life. I felt if the Cairo Museum is robbed, Egypt will never be able to get up again." Hawass's ego is perpetually on display; every television documentary about ancient Egypt appears contractually bound to feature him in his full braggadocio, and he has long been the absolute master of which archaeologist does and does not work in Egypt. But after forty-eight hours, his assessment of the situation changed. Hawass, appointed Mubarak's minister for antiquities after the eruption of chaos, now reported that nothing much had been stolen or destroyed, that all the museums were safe, that the people stood united against the looters, and that even the looted objects had been restored. "People are asking me, 'Do you think Egypt will be like Afghanistan?'" he recounted. "And I say, 'No, Egyptians are different—they love me because I protect antiquities.'" Now Egypt's monuments belonged to the world, but the source of all truth was made clear. The identification of Egypt's antiquities with a single man is not simply supremely egotistic but telling of a tradition where rulers point to monuments and demand respect, legitimacy, and obedience. It is only one of many apparent constants in Egyptian history. Whether or not Egyptians are different from their Iraqi or Afghan brethren, however, remains to be seen. As the Taliban came to power, the contents of the Afghan National Museum in Kabul were moved to safe locations. The museum itself was destroyed in 1994. Other antiquities, most notably the Buddhas of Bamiyan, were destroyed by the Taliban in a campaign of iconoclasm in 2001. The Baghdad Museum was looted in 2003 by local Iraqis and probably museum insiders and professional thieves during the U.S-led invasion. Though the site had been used as a firing position to attack U.S. forces, Washington was blamed for the looting and for failing to secure Iraq's thousands of archaeological sites, many of which were mined for antiquities that have disappeared, presumably onto world markets. Even as Mubarak held on, Hawass's positive narrative of the regime in command was challenged by telephone calls, faxes, and tweets that were aggregated on various web sites outside of his control. Near Cairo, reports indicated that looters attacked tombs and antiquities storehouses in Saqqara and Abusir. In Middle Egypt, the site of Ehnasya was attacked, but in Upper Egypt, Luxor and Aswan, sites with major tourism interests, were reported to be safe. And in a curious echo of ancient Egypt, "Sinai Bedouins" apparently attacked the Qantara Museum. Some allegations have even emerged that the thugs and villains who attacked the Cairo Museum, and who attacked opposition demonstrators gathered on Tahrir Square, were policemen and goons in the employ of the regime. True or not, such allegations have galvanized the opposition. 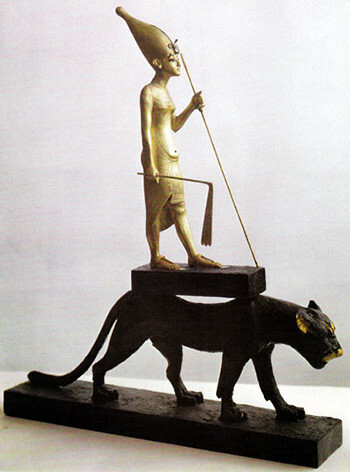 After the fall, Hawass was forced to admit that another gilded statue of Tutankhamun was missing from the Cairo Museum, along with other objects. "I have said if the Egyptian [Cairo] Museum is safe, then Egypt is safe. However, I am now concerned Egypt is not safe." As ever, the fate of Egypt was tied together with that of its leaders and its past. But why were antiquities targeted? The simplest answer is that most of Egypt's eighty-three million people survive on approximately US$2 per day. Antiquities represent valuable commodities to be exploited, whether directly as gold and other precious metals or as saleable items on a black market. The world's antiquities markets and museums could easily absorb better objects, disguise their recent origins, or hide them in stasis for years. This happens every day with loot from every corner of the earth. Wealthy collectors would be made aware of these objects as well, and private deals arranged. Common objects, which were not destroyed in the search for more excellent ones, would also be absorbed and marketed at the street level in places such as London and Geneva. Tourism annually contributes $15 billion to Egypt's gross domestic product of some $216 billion. How much looted objects would bring in is unknown. Looting tombs has a particular antiquity in Egypt. In ancient Egypt, tombs of commoners and kings were often looted just hours after the burial. The practice of sending the deceased toward the afterlife with elaborate and even lavish equipment was taken to an extreme by Egyptians. To these customs, the world owes thanks for the preponderance of items that fill museums today, which originated in the grave. Pyramids were burrowed into, subterranean chambers were mined, and mummies were torn open in search of gold, silver, and precious stones. Little seems different today. As in the past, stolen loot will fill the stomachs of Egyptians. But another answer to why Egypt's antiquities have been targeted has to do with the relationship of past and present in Egypt. Nationalism everywhere uses the imagery of the past and the fruits of archaeology to create a narrative about the greatness of today, in particular the "nation" and its leaders. The Egyptian state has not been an exception, but there are features that make it unlike other places. For one thing, Egypt, despite its immense size and subregions, has always been a single geographical and cultural unit. It was unified under a single dynasty—really military rule that later assumed theocratic dimensions—before 3200 BCE. Egypt is a container, bordered by deserts to the west and east, populated with unruly sand dwellers, and to the south in Nubia by tribes that are racially distinct. The novelty of pharaonic antiquities was not lost on Egypt's Greco-Roman, Byzantine, and Islamic rulers. The mythical power of Egyptian hieroglyphs and their mystical knowledge were compelling, and objects from scarabs all the way up to obelisks were bought, sold, and gifted. But the Islamic era also created a new series of monuments and narratives regarding Egypt's singularity and glory. The neighborhoods of old Cairo were the Fatimid, Mamluk, and Ottoman core of the city; they contained alleys and lanes, mansions and apartments that were the settings for Naguib Mahfouz's novels. Al-Azhar seminary, Khan al-Khali bazaar, and the al-Hussein mosque were the monumental core of another authentic and distinct Egyptian culture. That culture did not always mesh with the pharaonic past. In 1156, al-Aziz Uthman, son of Saladin, tried to demolish one of the Giza pyramids. The fourteenth-century Sufi Muhammad Saim ad-Dahr is reputed to have smashed the nose of the Great Sphinx when he saw peasants making offerings. After an earthquake in 1300 loosened the casing stones of the Giza pyramids, Sultan an-Nasir Nasir ad-Din al-Hassan took the opportunity a few decades later to remove them to build the mosques and fortresses of the still new city of Cairo. Symbols always vie with utility even for rulers. But the Islamic heritage of Egypt forms another important strand in the modern identity of Egypt, one that complements yet stands somewhat at odds with the more dramatic pagan monuments of the pharaohs. Napoleon's invasion of Egypt in 1799 ushered in antiquarian and then scientific research. His hundreds of artists and savants spread out across the land as part of a vast scientific and military enterprise documenting things as they were on the very edge of modernity. Europeans poured into the country and by the middle of the nineteenth century the continent's museums were filled with Egyptian objects and even monuments, torn from that country with no thought for science and still less for Egyptians. A sense of violation formed a thread in the growing Egyptian national consciousness and was made more intense by the British occupation of the country in 1882. But this began the golden age of Egyptian archaeology, tourism, and the growth of the modern state. The Oriental style that shaped Cairo and Alexandria and the obvious privileging of the pharaohs was a joint European and Egyptian project. Egyptian art and literature valorized the age of the pharaoh in the poems and plays of Ahmad Shawki and Mahfouz's early novels. Like Iraq and its Mesopotamian past, and Lebanon with its Phoenician past, the achievements of Egyptian ancestors were inspiration and legitimization for the emerging greatness of the present. But the Nasserite revolution of 1952 and pan-Arabism brought contradictions into the open. Was Egypt part of the "Arab nation" or was it Egyptian? The nearly simultaneous rise of the Muslim Brotherhood brought out similar contradictions with respect to Islam. Was Egypt an Arab or Egyptian country, or part of a Muslim world that knew no earthly borders? Just what is Egypt and Egyptian nationalism? These questions, too, have a certain antiquity. Egypt was always ruled from the core outward, but the pharaoh spent much time traveling the length of his realm paying obeisance to local deities, checking up on local authorities, and putting down rebellions. In the core today, in Cairo and its surroundings, where there is a developed upper and middle class, the answers will likely lean toward a nationalist explanation of pride and connection to the past. Egypt's pharaonic past is integral in the same way that the Cairo Museum, built in 1902, is an inextricable part of that city where a medieval Muslim core melds with the Oriental style of the nineteenth and early twentieth centuries while flanked by the looming monuments of antiquity to the west, and everywhere surrounded by the ugly towers and slums of modernity. That geography points to the shape of today's problems. As in the past, more remote areas of the Nile delta and those in Middle and Upper Egypt, which are removed from the political, cultural, and religious centers at Memphis or Cairo, were more underdeveloped, impoverished, backward, and traditional in outlook and practice. Only a few sites, such as Luxor and Thebes were patronized by the royalty and later by the modern Egyptian regimes in the name of tourism. The Bedouins of the Sinai rankled under the pharaoh's control and yearned to break free and lash out. In all these respects, little has changed today. The interpretation of nationalism and treatment of the past will likely follow this geography, at least for a while. Everywhere, however, the competing Islamic narrative looms. Egypt at least is an integral unit. One useful contrast is with Iraq. Ancient Mesopotamia saw the land divided into Babylonia in the south and Assyria in the north. These two regions were socially and ethnically distinct, but from an early time, Mesopotamian kings created a mythological vision of unity, which they then used as justification for violently attacking and dominating their neighbors. Unity was a fiction but a divine one. The reality consisted of fractious tribes, agricultural villages, competing city-states, and violent politics. This was no less true for Saddam Hussein at-Tikriti than it was for Sargon of Akkad, the "true king," who rose from cup-bearer to the king of Kish to the king's killer, and went on to unite Mesopotamia and found a dynasty. Kings themselves were the greatest source of disorder. In ancient Egyptian tradition, one of the greatest roles of the ruler was ma'at, the legitimate maintenance of order and balance. Of course, minions of the ruler recorded this pretension for posterity, but fear of chaos was pervasive, not only for the ruler but the ruled. Invasions by desert tribes, the annual floods—which could bring too much water or not enough, or bring it too early or too late in the growing season—and famine, hunger, and violence were all too real. The reward of living in a rich ecosystem is plenty with the caveat that nature is fickle. A kind of national awareness emerged in ancient Egypt, at least with respect to xenophobia toward foreigners, in part through fear of chaos. The fact that the kings of Egypt were depicted literally as gods who held heaven and earth together was another metaphysical dimension of the ancient Egyptian "nation," always backed up by military force. Piety vied with poverty and with fear. But then as now, the state was the provider. Most ancient Egyptians were bound to various royal or temple establishments. Despite any liberalization undertaken by Mubarak, state and military industries continue to dominate the Egyptian economy. The fate of many Egyptians was and is tied directly to the regime. A similar sort of chaos is playing out in Egypt today. Price subsidies for food and fuel account for 7 percent of the state's budget, and more than 40 percent of Egypt's food is imported. Food inflation reached 17 percent in December 2010, and hundreds of thousands of university graduates are unable to find jobs. Chaos thus has many sources—an educated population shut out from prosperity and an underclass on the verge of hunger. Antiquities—identified now with the Mubarak regime and a potential source of revenue for impoverished Egyptians—have suffered from time immemorial. The upper and middle class Egyptians who locked arms to protect the Cairo Museum from the initial bout of looting are too few and spread too thin to defend even a fraction of Egypt's museums and monuments. But the rioting that has unfolded, perhaps with the regime's contrivance, has given Egyptians a clear picture of chaos. Egypt's prisons have been emptied of criminals, terrorists, and political prisoners, and reports indicate that looting of shops and homes is widespread. The army stands as the last defender of order and balance and may yet step in to restore order, end the neo-liberal economic experiment, and defend its own prerogatives. It has done so for 5,000 years. As the Muslim Brotherhood emerges from the shadows to participate and perhaps dominate the revolution, the question of its regard for antiquity must also be raised. Egypt's Islamists also have a vision of the past. It is difficult to discern what their attitudes toward antiquities would be except indirectly. For example, Egypt's grand mufti Ali Gomaa issued a fatwa in 2006 banning the display of statues in homes and was joined in his condemnation by Sheikh Yusuf al-Qaradawi. The fatwa was condemned by Egyptian intellectuals and even by the Muslim Brotherhood. It is also well to remember that Khalid al-Islambouli cried, "I have killed the pharaoh," after shooting Anwar Sadat on October 6, 1981. The pharaoh is not a positive Qur'anic image but a tyrant. The Luxor massacre of 1997, where sixty-two tourists were slaughtered, saw the Islamist al-Gama'a al-Islamiya attack the Temple of Hatshepsut. The modern Egyptian and Western relationship with the Egyptian past was the setting for the attack. Tourism was clearly intended to be the victim. How the Muslim Brotherhood, dedicated to Islamizing Egypt, would deal with tourism, museums, and antiquities is unclear. Certainly, in the short term, for the sake of foreign currency and appearances, little will change. But the example of Afghanistan under the Taliban is in the background. The destruction wrought on remains of the Jewish temples in Jerusalem by the Palestinian Islamic authorities should also be mentioned. Perhaps most telling, however, is the almost complete erasure of Islamic historical remains from the cities of Mecca and Medina, including structures associated with Muhammad. An Egypt dominated by the military will almost certainly seek to restore both the country's symbols and the practical mechanisms of tourism. Whether the military can ride the crocodile of popular unrest and a population empowered by social media yet lacking meaningful liberal democratic roots remains to be seen. But the religious desire to create a rupture with the past in the name of fighting idolatry is deep. In all this, the practicality and wisdom of repatriating antiquities to Egypt is dubious. Zahi Hawass in particular has been determined in his pursuit of antiquities that were taken from Egypt over the past centuries. The Rosetta Stone, found by French engineers but taken as British war booty, tops his list. But even objects given by Egypt as gifts have come under his acquisitive eye. Cleopatra's Needle in Central Park was erected in 1881, a gift from the Khedive of Egypt. But 130 years of standing out in the rain does no obelisk good, and Hawass has demanded that it be preserved, or he will take it back. His pursuit of Egyptian objects outside of Egypt has been almost as relentless as his drive to become the face of Egyptian archaeology everywhere. The pharaoh is gone and so is Hawass. In the meantime, those concerned about Egypt's past can only sit back and watch as a genuinely Egyptian transformation takes place, one in which the relationship of past and present will inevitably be redefined yet along familiar lines. Alexander H. Joffe is a Middle Eastern historian and archaeologist. He is the author of "Museum Madness in Baghdad," published in the Spring 2004 Middle East Quarterly. He has taught archaeology at the Pennsylvania State University and Purchase College, State University of New York. The Christian Science Monitor, Jan. 28, 2011. The Washington Post, Jan. 30, 2011. Zahi Hawass, "State of Egyptian Antiquities," Zahi Hawass website, Feb. 3, 2011. "Afghanistan: Hidden Treasures from the National Museum, Kabul," National Geographic, accessed Feb. 8, 2011. NewsCore Agency, Feb. 13, 2011. Al-Masry al-Youm (Cairo), June 8, 2010. The Egyptian Gazette (Cairo), Jan. 18, 2011. "Youth Unemployment, Existing Policies and Way Forward: Evidence from Egypt and Tunisia," The World Bank, Washington, D.C., Apr. 2008. The Gulf Today (Dubai), Jan. 30, 2011. Middle East Online (London), Apr. 3, 2006. Lawrence Wright, The Looming Tower: Al-Qaeda and the Road to 9/11 (New York: Alfred A. Knopf, 2006), p. 50. "Muslims start petition to stop Saudi destruction of Mecca and 'The House of Mohammed,'" Militant Islam Monitor, Sept. 29, 2005. The New York Times, Mar. 3, 2011. Related Topics: Egypt | Alexander H. Joffe | Spring 2011 MEQ receive the latest by email: subscribe to the free mef mailing list This text may be reposted or forwarded so long as it is presented as an integral whole with complete and accurate information provided about its author, date, place of publication, and original URL.